The House of Seven Mabels by Jill Churchill, a Mysterious Review. Review: The House of Seven Mabels is the 13th outing for Jane Jeffry in Jill Churchill's long-running cozy mystery series. When the title of a book is more clever than the book itself, there's a problem. It's not that The House of Seven Mabels is a poorly written or constructed mystery; it's just that it's so predictable. 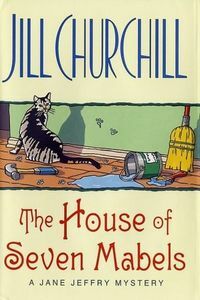 The premise is promising, with Jane and her best friend Shelley hired by hard-core feminists to restore and redecorate a local mansion, but Churchill never delivers. Fans of Jill Churchill and cozies in general will no doubt enjoy this latest entry in the Jane Jeffy series, but those looking for any originality in their mysteries should look elsewhere.